I was extremely excited by the release of Captain Marvel. First off, I’m a huge Marvel fan, but secondly, I was interested to see how a female protagonist in a superhero movie would play out. Needless to say, I thoroughly enjoyed it. Aside from Captain Marvel and its ties to the other Marvel films and her piece to the overall puzzle, this particular film’s release during this period of time in our society is reflective of, and recognizes, our societal views and struggles as females. One of Vers’ struggles throughout the film, aside from fighting off another species, was self-identity. She struggled with this in a different manner than other female characters; this is the Marvel universe, and therefore, Vers’ memory is nearly wiped out. Throughout her journey, she begins to regain her memories while still struggling to figure out who she is. The idea of trying to figure out our place in the grand scheme of the universe is a struggle that is commonly shared amongst people, which is the first element that makes Vers relatable to her audience. What’s more empowering about Vers is that during the end of the film’s fight sequence, Vers is knocked down to the ground. Suddenly, a montage of all the younger versions of herself appear. Images appear of her performing different activities as a young girl and being knocked down by them. The voices of those who have told her she’s “weak” and “too emotional” muddle throughout, both of which are so frequently spoken throughout the movie. But then, each of the younger versions of Vers get up off the ground and stand tall and proud. She then continues to fight. It’s extremely empowering and encouraging to see a strong female on the grand stage, being a Marvel superhero and going through this journey of self-discovery. It’s inspiring because, though it’s merely a movie, it’s reflective of how our society views women. Women are no longer always portrayed as frail and dependent on a strong male to swoop in and save the day. 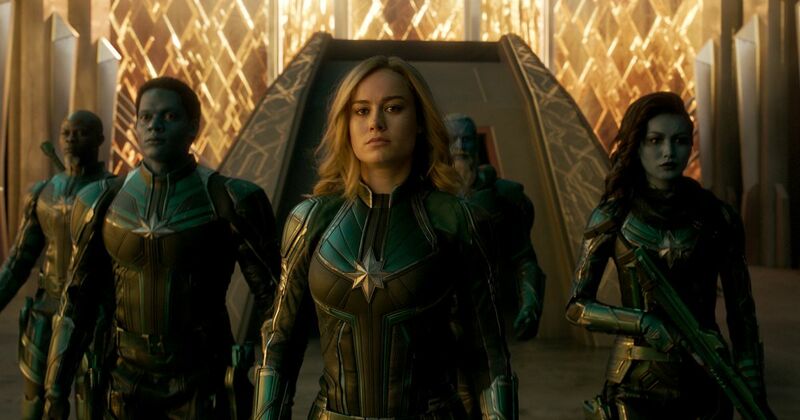 Captain Marvel shows us that we, as a society, recognize the strength that women possess, and that women can truly be strong and independent.